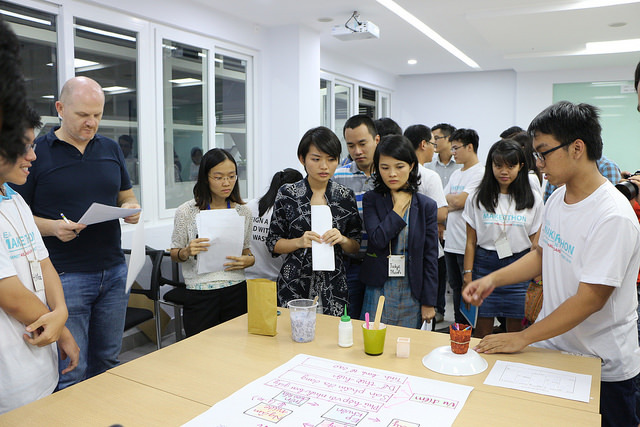 HCMC, June 27th, 2016 – Fablab Saigon and the South East Asia Makerspace Network (SEAMNET) have successfully organized the first Makerthon on Circular Economy in Vietnam on Sunday 26th June 2016. CFVG, Centre de Formation Franco-Vietnamien a la Gestion, hosted the event in HCMC. At the opening ceremony, Ms. Anais Kit, French Representative at CFVG, welcomed the participants and highlighted CFVG was really glad to host FabLab SEA Makerthon event. CFVG is a pioneer in many higher educational innovations in Vietnam which specialize in MBA (Master in Business Admiration), MMSS (Master in Marketing Sales and Services), MEBF (Master in Economy Bank and Finance) and Ph.D in Management. 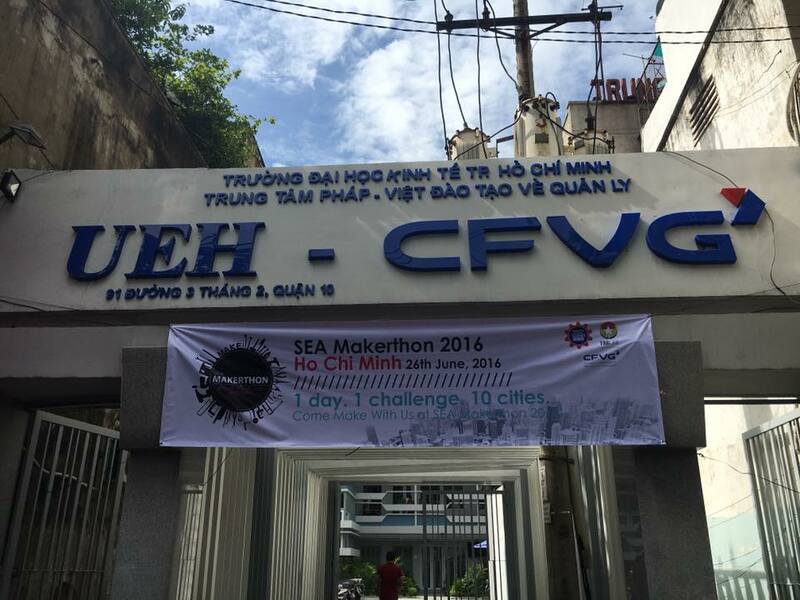 CFVG sees in the collaboration with Fablab Saigon a meaningful and innovative way for the institution to reinforce its bound with the young entrepreneurs and continue its pioneering work by opening Entrepreneurship and Innovation programs in the coming years. The 2 challenges “How might we reduce waste from packaging of food and beverage products?” and “How might we increase the lifetime of packaging of household products?” inspired a total of 11 participating teams from 2 to 4 members, with a mix of students, and professionals designers and engineers. For Mrs Hoang-Anh Phan, co-founder of Fablab Saigon, the event’s success shows how makers in Vietnam can be a driving force for both economic growth and positive change through entrepreneurship and innovation, when given access to the right tools and concepts, such as circular economy. 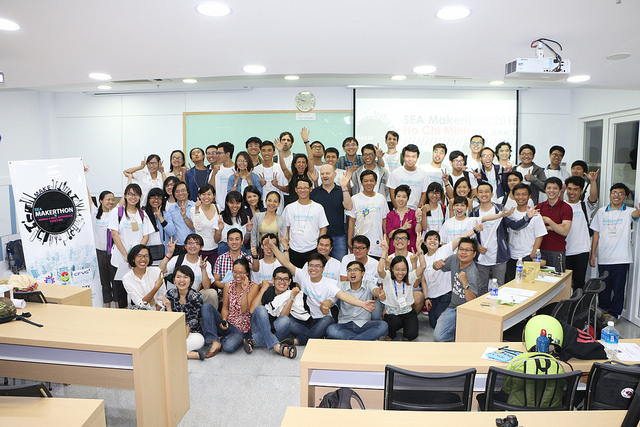 Ms Melanie Tan, SEAMNET Representative and part of the jury panel, praised the creativity of the participants and was very delighted that Ho Chi Minh City successfully kicked off the series of SEA Makerthon in the region. The Makerthon will also take place in August in Hanoi with Fablab Hanoi, and in 9 other cities in 6 different countries in the South East Asia region. She looks forward to welcome the winning team of Ho Chi Minh City, the “Bamboo Team” at the Grand Finale in Singapore at the InnovASEAN conference (Southeast Asia Makerspace Summit) on 15 and 16 Oct. 2016. The team comprising of Ngô Minh Chính, Phồng Triều Dương and Lê Hoàng Quy, came up with an idea to create a B2B logistics solution reducing the wastage in the packaging and logistics industry. In Singapore, the team will compete against the 9 other SEA Makerthon winning teams and will have the opportunity to meet other makers, makerspaces partners and investors at the largest gathering of makers in the region. Fablab Saigon will provide 3 months support to the team to help them further develop their idea, from a prototype to an early stage start-up. This entry was posted in Competition, Events and tagged circular economy, makerthon. Bookmark the permalink.